“Mission 26? as it was dubbed because of the spacecraft’s 25 flight missions for NASA started just before midnight Thursday and finished Sunday afternoon, more than 16 hours late. Gizmodo made some animated GIFs of the close calls. Amazing; like a thread through a needle. 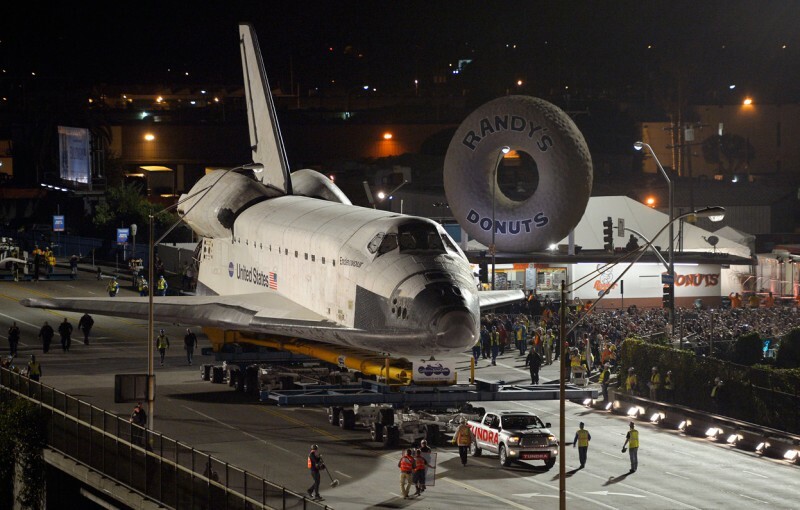 The space shuttle Endeavour is on its last mission today, a 12-mile creep through Los Angeles city streets on a 160-wheeled carrier. It is passing through neighborhoods and strip malls, headed toward its final destination, the California Science Center in South Los Angeles. At times, the shuttle has barely cleared trees, houses and and street signs along a course heavily prepared for the trip. The move will cost an estimated $10 million, according to the Exposition Park museum. Gathered here are a few images of Endeavour’s last journey. 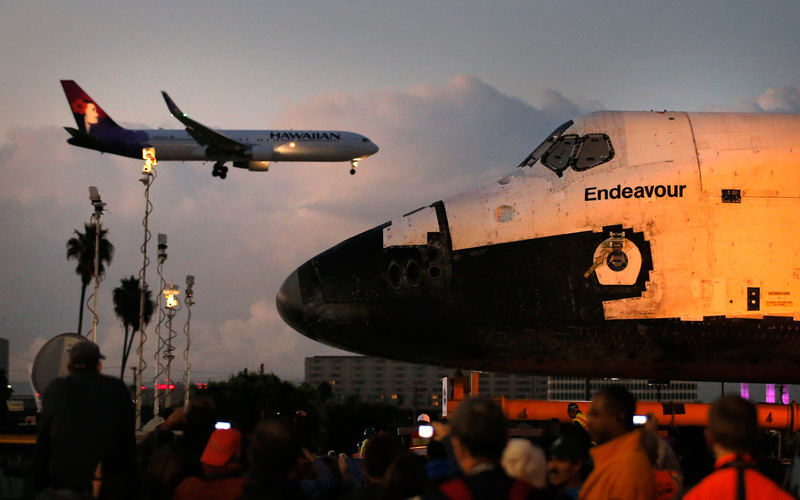 The space shuttle Endeavour sits in a strip mall as a Hawaiian Airlines jet approaches a runway at Los Angeles International Airport in Los Angeles, on October 12, 2012. The space shuttle Endeavour makes its way down Manchester Blvd. over a closed 405 freeway in Inglewood, California, on October 12, 2012. 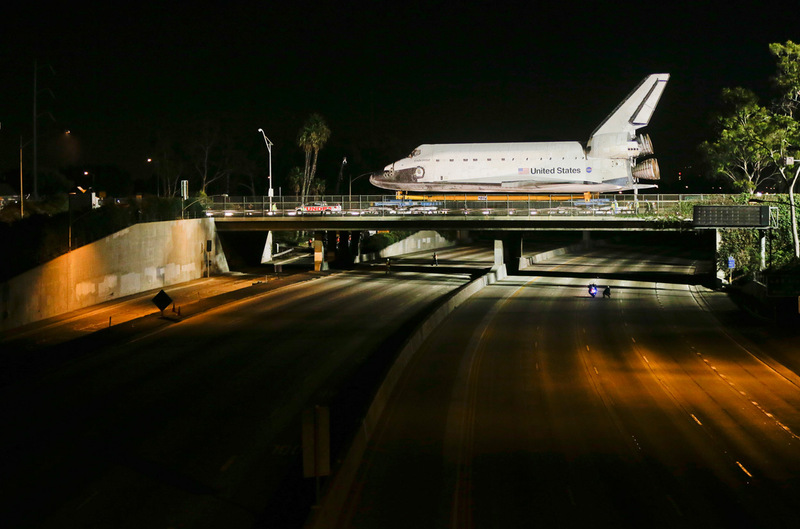 Endeavour is slowly moved across Interstate 405 by a Toyota Tundra, on October 12, 2012, in Los Angeles. 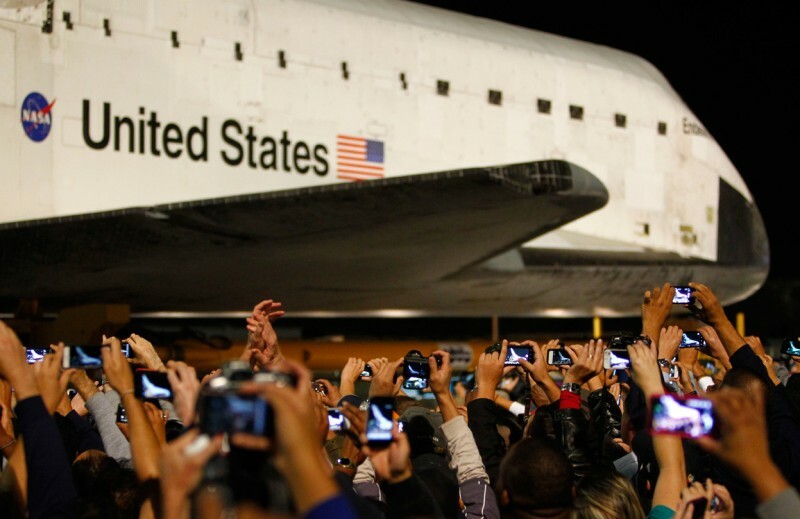 Spectators take pictures as the Endeavour is towed through Inglewood, California, on October 12, 2012. 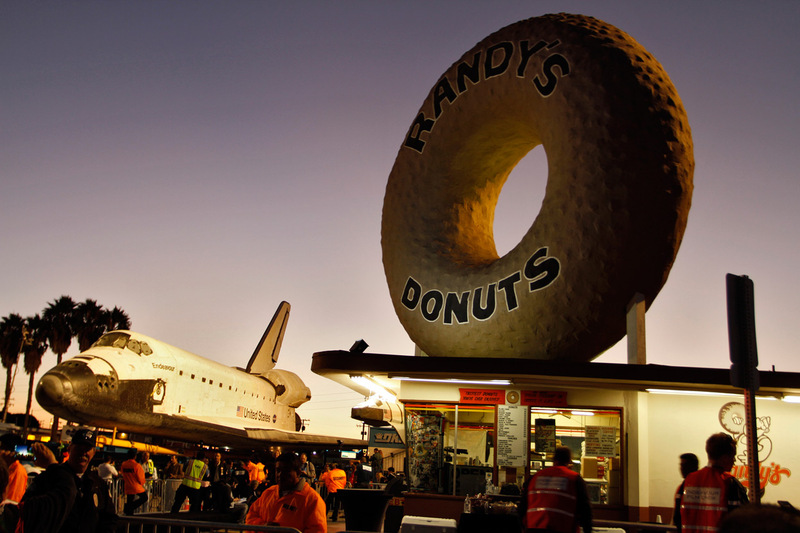 Endeavour stops in front of Randy’s Donuts on Manchester Avenue while being moved from Los Angeles International Airport to its retirement home at the California Science Center in Exposition Park, on October 12, 2012. 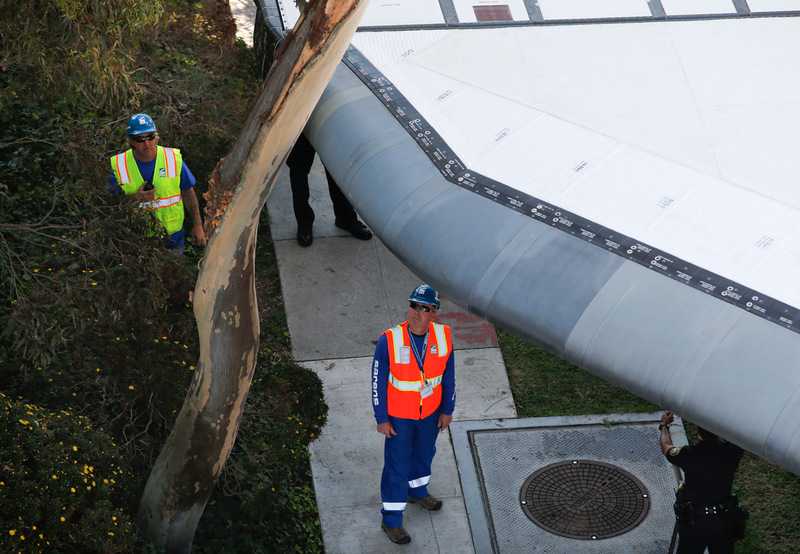 Endeavour’s wing barely clears a tree as it slowly moves along city streets in Inglewood, California, on October 13, 2012. 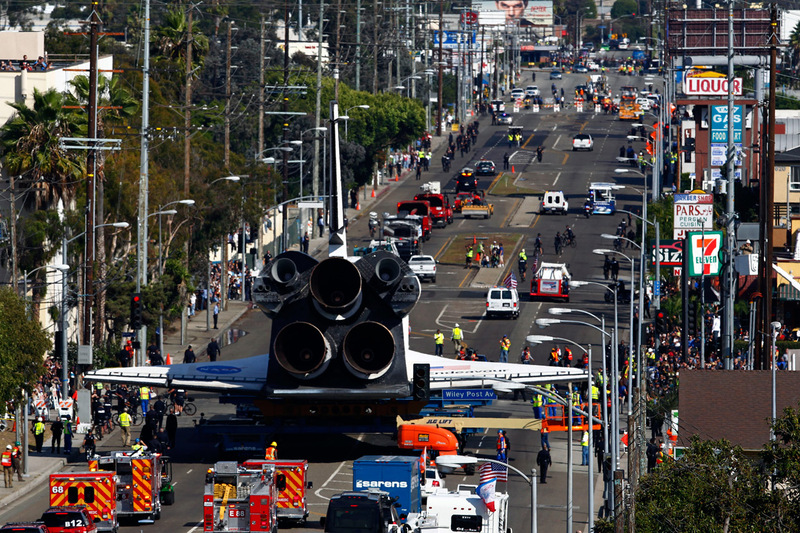 Spectators gather to watch the space shuttle Endeavour slowly move along Los Angeles streets, on October 12, 2012. 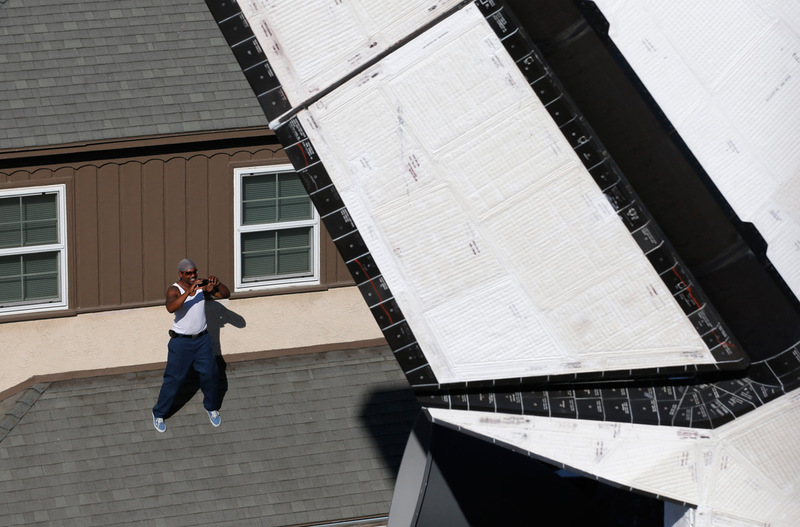 A man takes pictures as Endeavour slowly pass, in Inglewood, California, on October 13, 2012.